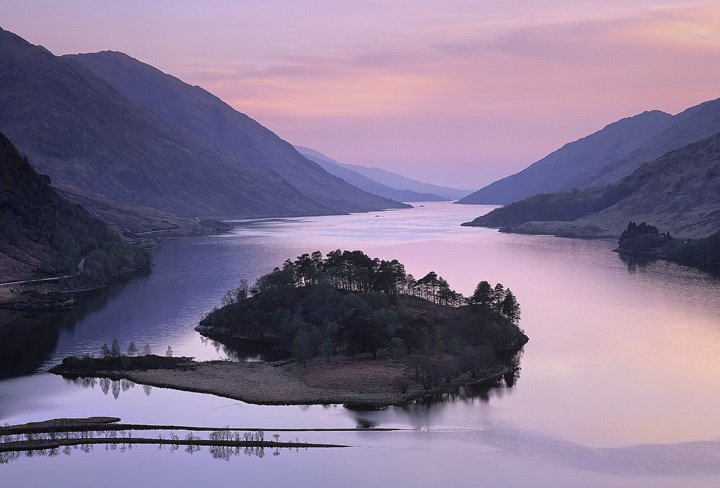 For just a few days every year the sun sets down the length of one of the narrowest lochs towards the Glenfinnan monument. I turned up hopeful of a suset but on this occasion cloud obscured the sun. Never-the-less hanging around for 15 or so minutes afterwards paid some dividends as the pink afterglow melted into the twilight of dusk creating a delicious combination of pink and blue. The higher viewpoint than standard excludes the monument but has the benefit of isolating the island in the loch.